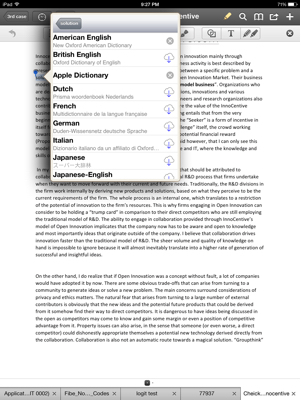 Is there an iPad PDF reader that allows in-app dictionary customization? I want to use my iPad to read PDFs of my textbooks. There are often vocabulary terms which I would like to create my own definition for and then be able to click on that word or phrase later in the PDF and see my definition. This seems different from the standard note function which only puts the text in the location where it was defined. I looked through reviews of PDF readers and none of them mentioned specifically what I am looking for. I am willing to pay up to $10 for this. Is there an app that has what I am looking for? PDF Expert lets you choose from the different Apple dictionaries available (whether they are installed or not), if that is what you are searching for. If what you look for is another, custom type of dictionary where you can load your own dictionaries, I don't think PDF Expert can do so. Not the answer you're looking for? Browse other questions tagged ipad software-recommendation pdf . Is there an iPad app that will 'play' a large PDF file as a slideshow? Is there an iPad PDF Reader app that has autoscroll? iPad PDF reader that supports multi-page viewing? iPad PDF Reader with annotation support? Is there a PDF annotation app for the iPad with minimal (or no!) annoying page transitions? What iPad PDF reader can I use to highlight text? Is there a PDF reader that formats for mobile screens?